Author Ellen Saltonstall is a yoga instructor who also has a background in massage therapy and dance. She has written several prior yoga-themed books on anatomy, osteoporosis, and arthritis. In The Bodymind Ballwork Method, Saltonstall coalesces her various areas of expertise to offer a comprehensive guide to self-care and healing through the use of rubber balls for self-massage and release. This work is designed to create a sense of "embodied self-awareness," or attention to one's present sensory experience without judgment. Saltonstall lays the groundwork for this method via a systematic background review as presented in Part 1. She begins with illustrating the mind-body connection through the yogic concept of koshas, or five layers of being. Next, she provides details on the relationship between the nervous system and the body's stress response. This detailed breakdown of the brain and connected functions is explained in an easy-to-read format, with helpful illustrations accompanied by use of bolded text for key points. Many of these concepts will be familiar to readers, such as the fight/flight/freeze mode activated by the sympathetic nervous system and the role of the hormones epinephrine (adrenaline) and cortisol in stress. The account of physical constructs wraps up with a discussion of pain as it relates to the body's soft tissues. The final two chapters in this first section center around psychological theories. Saltonstall reviews the development of body schema/body image, describing how this is impacted by external conditioning factors. Along these same lines, she talks about trauma, particularly how the experience of trauma may give rise to defense mechanisms as well as the role of the higher brain function in reclaiming trust and agency. With this foundation established, Saltonstall lays out the specifics of her method, starting with the types of balls needed. Saltonstall recommends a total of nine rubber balls of differing sizes, with this variety affording the best means of targeting assorted areas of the body. Saltonstall also introduces the four main principles of the method and discusses how these combine with perception and breath. The ballwork practice section begins with "The Best Basic Everyday Practices," a chapter providing a total of six ballwork routines recommended for daily use and featuring the neck, shoulders, spine, pelvis, hips, and feet. The remaining chapters refine and expand on this basic method. For example, the chapter on the spine offers supplementary techniques such as adding a third ball and using the balls vertically. Additional areas of the body are worked, including the head/face, abdomen/ribs, arms/hands, and thighs/lower legs. Virtually every page is accompanied by a black and white photo demonstrating the relevant procedure plus line drawings displaying the specifics of ball placement. The book concludes with a review of the main tenets of the ballwork method and the suggestion that in the future, there will be a general trend towards more holistic approaches that speak to the mind and the body as an integrated unit. In the spirit of full disclosure, I attended a ball-based yoga workshop with Ellen Saltonstall several years ago. Her interpersonal style was straight-forward yet empathic, and that is exactly what comes through the pages of The Bodymind Ballwork Method. 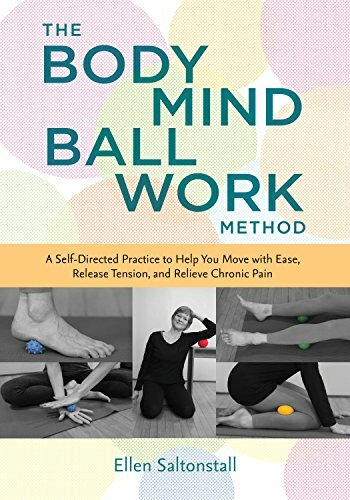 Saltonstall is not the only professional who is advocating ball self-massage, but her breadth of knowledge about anatomy, brain function, psychological factors, and trauma lends a unique voice. As both a clinical psychologist and a yoga instructor, I would recommend this book for those seeking a self-directed means both to address stress and tension and to improve overall health and wellness.